Are you hungry for a tuna sandwich, a tuna burger, or a hot tuna pie? 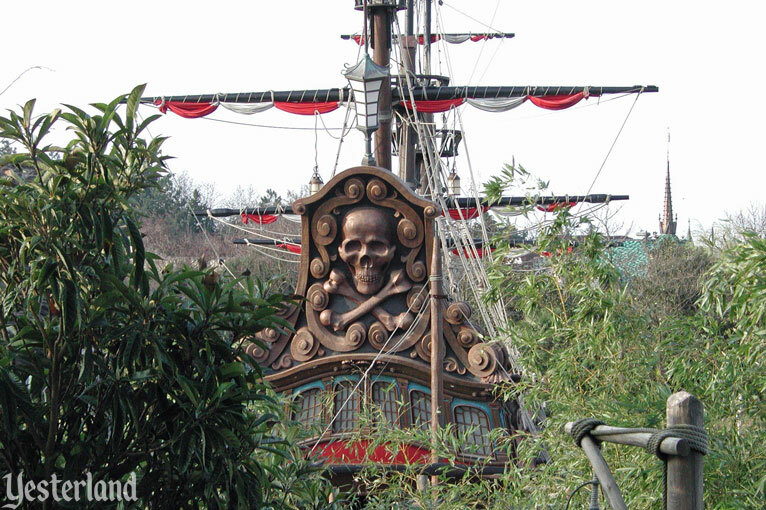 Then plan to eat at the Pirate Ship. Get your food at the counter below the deck. Then head for a table in Skull Rock Cove, right behind the ship. Did you have a chance to visit Paco the Talking Parrot while you were onboard? He’s a real parrot, unlike those Audio-Animatronic ones you might find elsewhere. 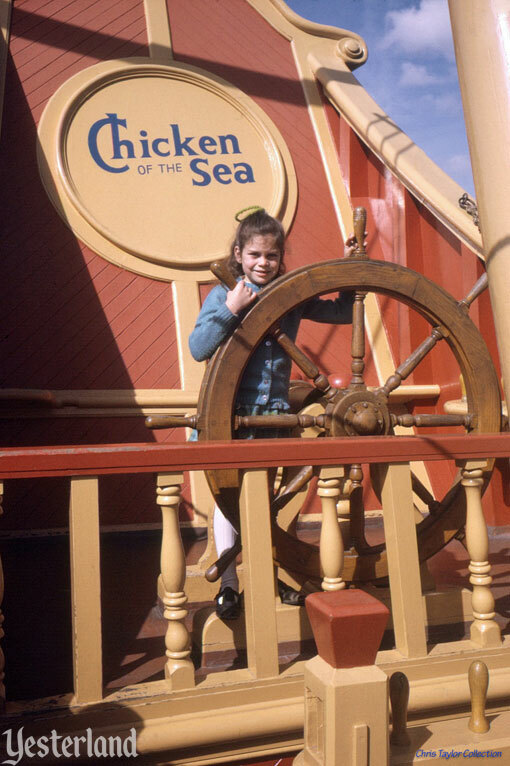 The Chicken of the Sea Pirate Ship and Restaurant was a Disneyland landmark from 1955 until 1982, although the name changed to Captain Hook’s Galley when Chicken of the Sea dropped its sponsorship in 1969. 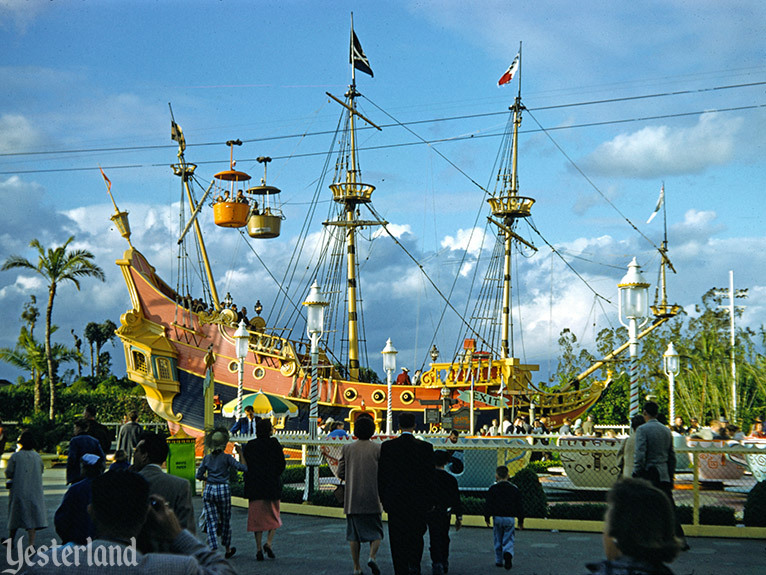 As construction of Fantasyland reached a frantic pace prior to opening in 1955, it became apparent that there wasn’t enough room left in Fantasyland to build the Pirate Ship. 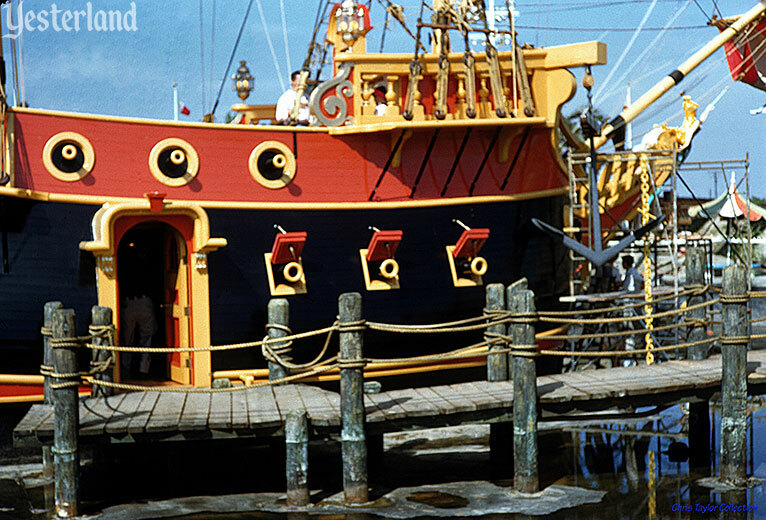 So space was cleared behind the Main Street Opera House (which was being used as the lumber mill) and the entire ship was constructed backstage. 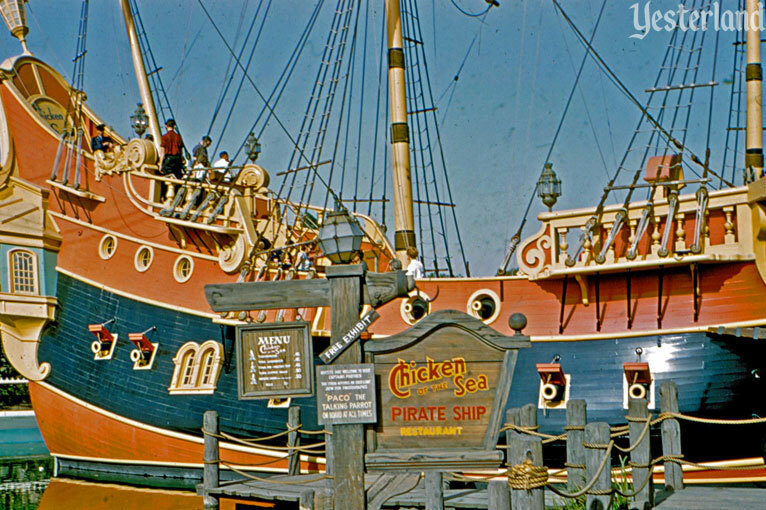 Shortly before opening, the fantasy of the flying ship came true, when the Chicken of the Sea Pirate Ship actually flew into Fantasyland… courtesy of a nearby construction crane. 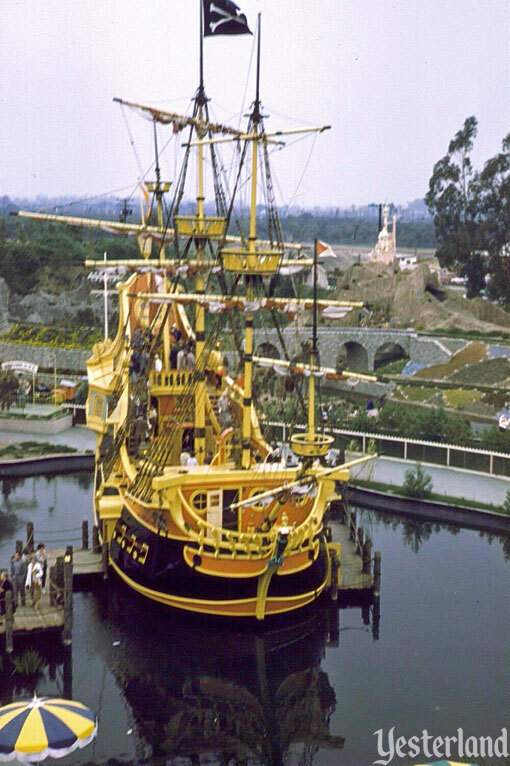 Originally, Captain Hook’s Pirate Ship sat in a simple pond. 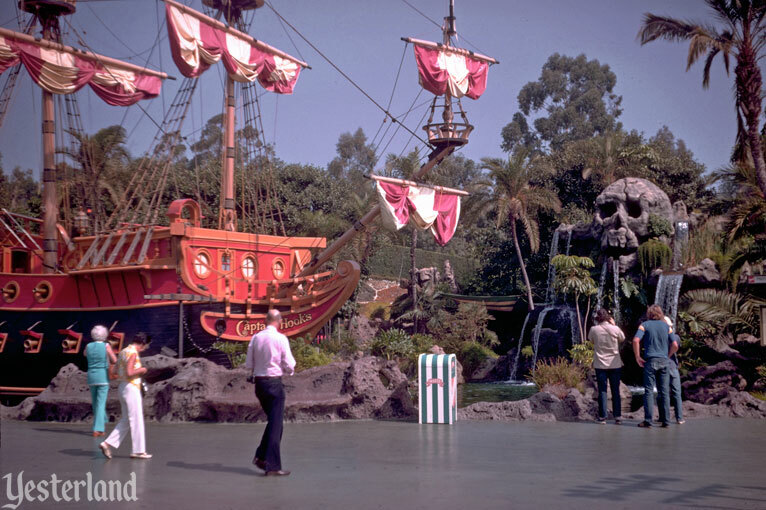 In 1960, the pond became an exotic, tropical setting from Peter Pan with the addition of Skull Rock. 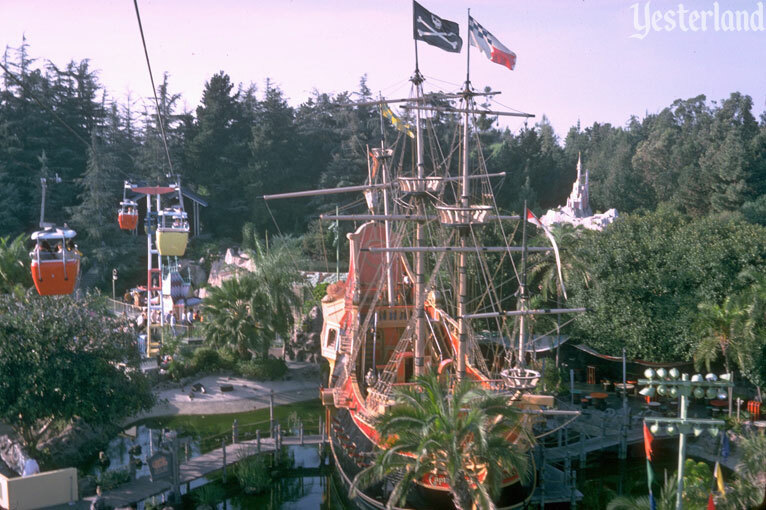 The Pirate Ship was supposed to move a second time. 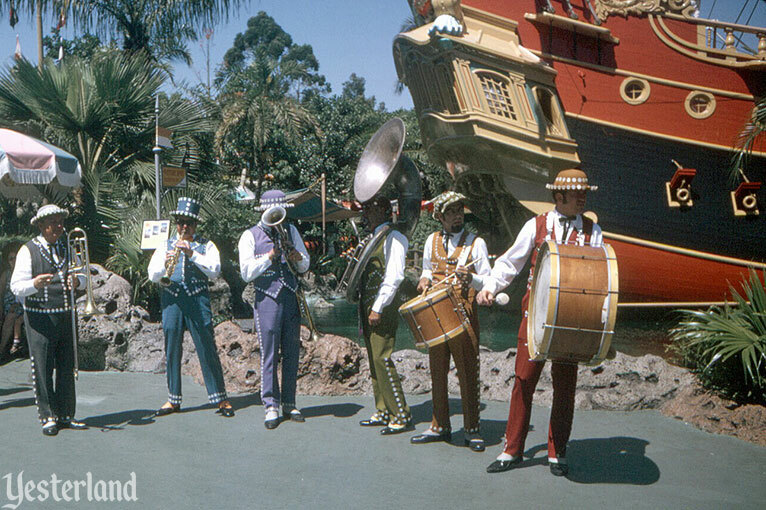 In 1981, work began on Disneyland’s New Fantasyland. 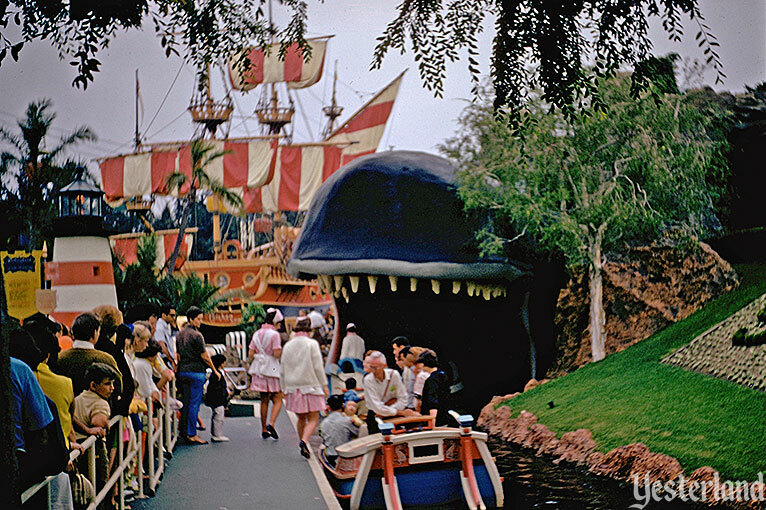 To improve pedestrian flow in the crowded land, plans called for the Pirate Ship to be relocated to the Small World Promenade. It wasn’t a simple matter of digging a canal and floating the ship to the new location. In fact, the ship wasn’t really a ship. It was an aging wooden building in which wood at the base had been replaced with concrete over the years to better withstand sitting in the water of a tropical lagoon. 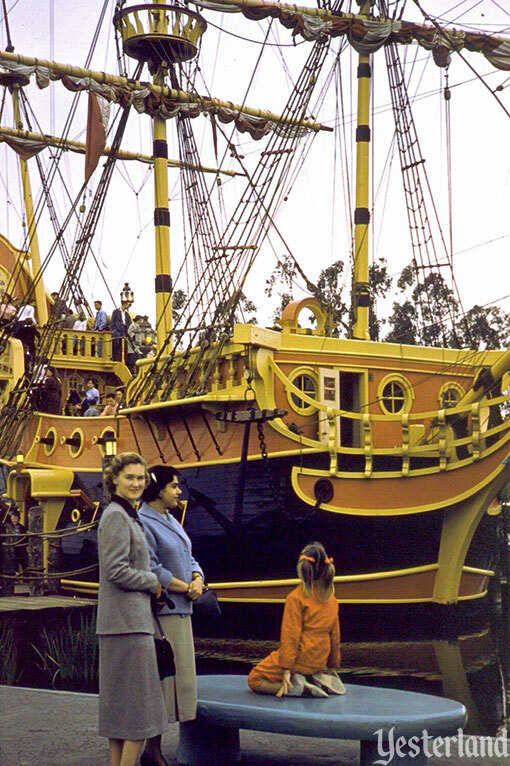 By summer 1982, the ship was sitting in a dry construction site, but the ship could not be moved. Bulldozers unceremoniously demolished the longtime landmark. Trucks hauled away the mangled timbers and chunks of concrete. There was neither the time nor the budget to build a replacement. 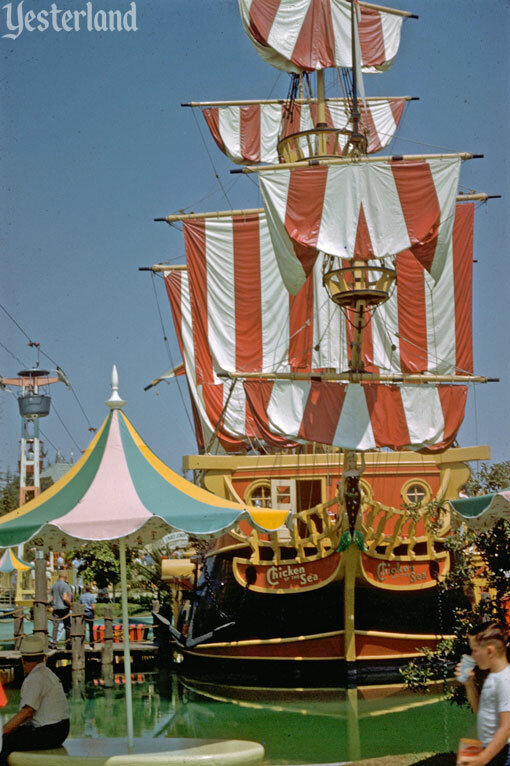 So when the New Fantasyland opened in 1983, the ship had “flown away” forever. 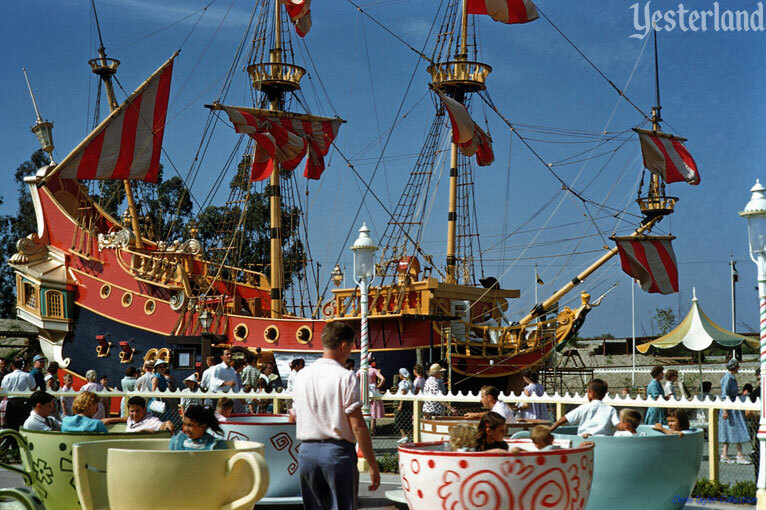 A new version of the popular Dumbo attraction occupies the ship’s former space. 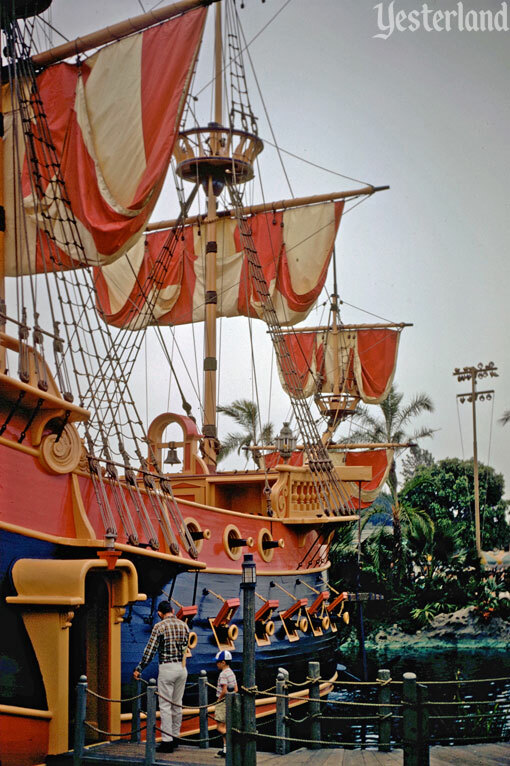 Although Disneyland’s Pirate Ship has been gone since 1982, the Imagineers didn’t forget about it. The Disneyland Hotel’s old Olympic size pool was demolished to make way for Downtown Disney. To take its place, a new feature pool opened in 1999 between the hotel’s three towers, where there had previously been a marina and a lake. 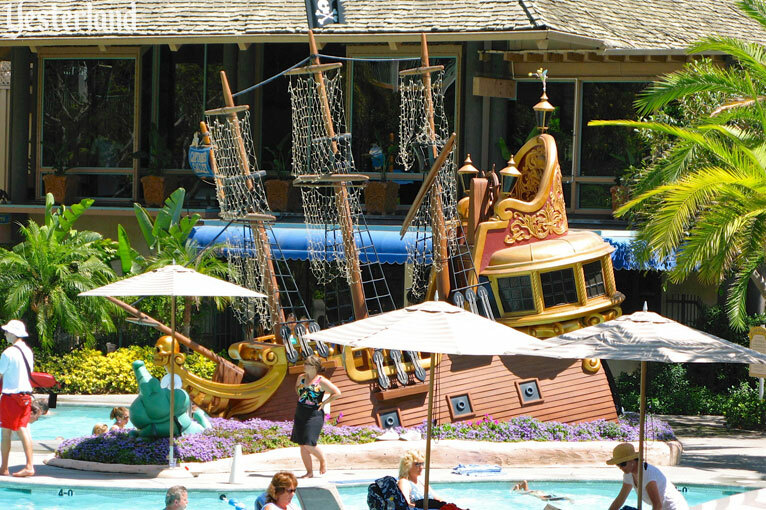 The Never Land Pool, with its Peter Pan theme, had its own little version of Captain Hook’s ship (but it’s now gone). 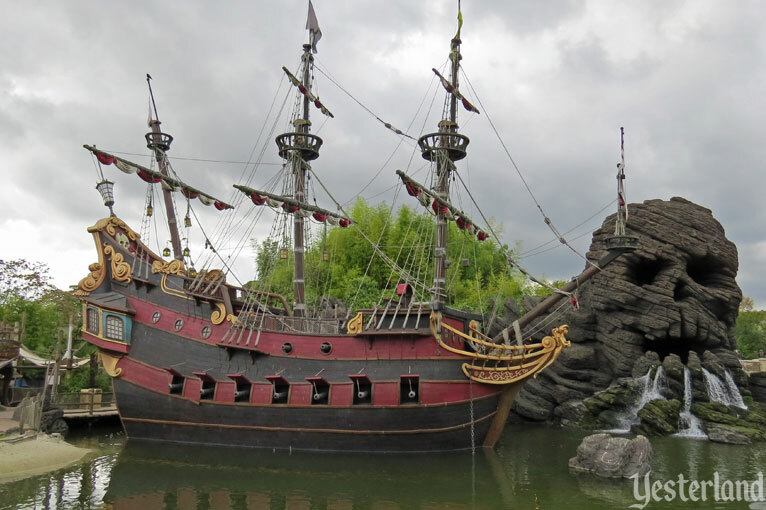 If you want a full-size Pirate Ship, you’ll have to head to Adventureland at Disneyland Paris. 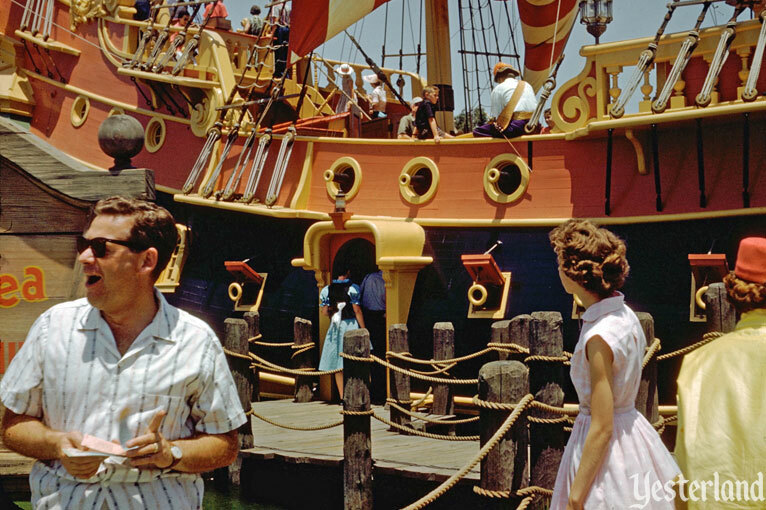 Captain Hook’s Galley is a counter-service restaurant. It sits adjacent to ominous Skull Rock—just like the long-lost original. Sorry. There are no tuna sandwiches, tuna burgers, or hot tuna pies at the Paris version. You’ll have to settle for hot dogs, potato crisps, doughnuts, and ice cream.